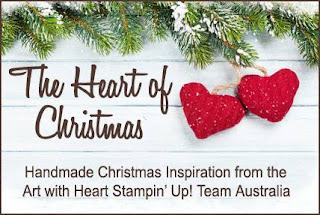 Hi everyone and welcome to week 22 of Christmas inspiration with Art with Heart Stampin'Up Team Australia. Cannot believe how fast time is going only 5 more cards to go, this has given me a great head start for the Christmas rush. 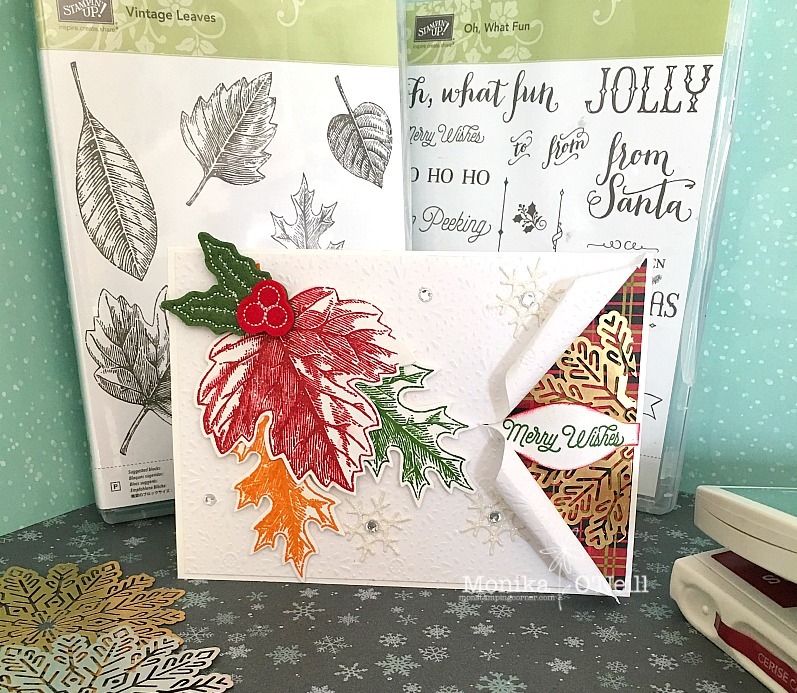 For today's card I used Vintage Leaves and Oh What Fun Stamp set, for the inks I used Garden Green, Cherry Cobbler and Pumpkin Pie. 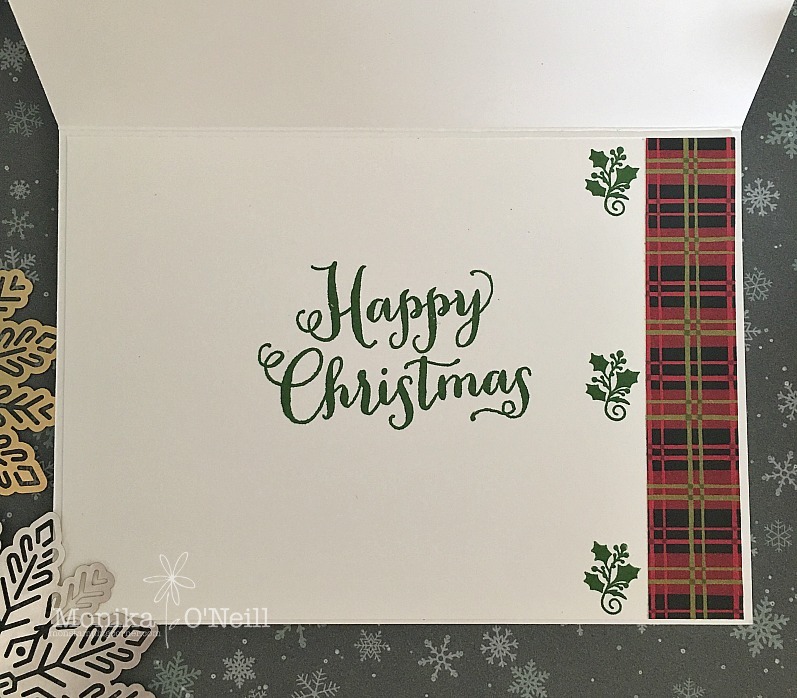 Base of the card is Thick Whisper White, the first mat is from Christmas Around the World DSP I cut a slit on the side of the white mat and rolled it with a pen on each side and cut a gold Foil Snowflake in half, the sentiment is from the Oh What Fun stamp set using Garden Green and I used the Build a Bow Punch to cut it out and trimmed a little on each end and sponged a little cherry cobbler around the edge and added a mini dimensional on each end. The leaves are stamped in Garden Green, Pumpkin Pie and Cherry Cobbler and I used the matching framelits to cut them out. I used the Holly Leaves from the Stitched Felt Embellishments and cut out 3 snowflakes from the Seasonal Layer Thinlets and added a Rhinestone Basic Jewel in each centre and finished off with the Clear Wink of Stella on the leaves. And a pic of the inside of the card. Hope you enjoyed this weeks card. To see more beautiful inspiration from our very talented ladies you can view all our participants on the lovely Claire’s blog . Have a great week and will see you again next week with some more great cards.